On sheet of waxed paper or in shallow bowl, mix 2 tablespoons flour, 1 teaspoon salt and the white pepper. Place beef on flour mixture; turn to coat evenly. Spray 5- to 6-quart slow cooker with cooking spray. Heat 12-inch nonstick skillet over medium-high heat. Add beef to skillet; cook about 5 minutes, turning once, until golden brown on both sides. Place in cooker. In small bowl, mix broth, mustard, garlic and dill weed. Pour over beef in cooker. Place onion, carrots and potatoes on top of beef. Sprinkle with lemon-pepper seasoning. Remove beef and vegetables from cooker; place on large serving platter and cover to keep warm. In small bowl, beat all sauce ingredients except sour cream with wire whisk until smooth. Strain any fat from liquid in cooker. Pour liquid into 1-quart saucepan; heat to boiling over high heat. Stir flour mixture into hot liquid; cook 2 to 3 minutes, stirring constantly, until thickened. Remove from heat; stir in sour cream. Cut beef into 8 serving pieces. Serve sauce with beef and vegetables. It's important to place the ingredients in the slow cooker in the order the recipe suggests so that everything gets cooked evenly. Because the grain in a pot roast changes direction, it isn't always easy to get tender slices. 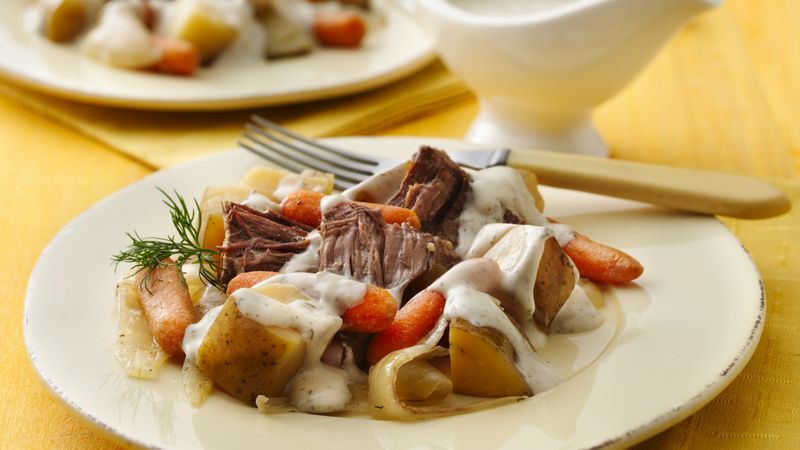 To slice pot roast, place the roast on a carving board or platter. Hold the meat in place with a meat fork, and cut between the muscles. Remove one section of the meat at a time. Turn the section so that the grain of the meat runs parallel to the carving board, and cut meat across the grain into 1/4-inch slices.